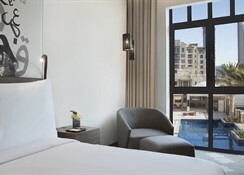 Manzil Downtown Dubai (Ex Al Manzil Hotel) is situated in The Old Town precinct with easy access from Sheikh Zayed road via Financial Centre Road. Discover the spice of life; by exploring the area and make a discovery of oneâ? ?s own. Just a five-minute walk from, Burj Khalifa, The Dubai Fountains, The Dubai Mall and right in the heart of the Burj Khalifa commercial and residential precinct, one will find Manzil Downtown Dubai, a four star boutique hotel that presents a perfect fusion of old and new. It is a contemporary business hotel with a warm and inviting ambience - making it the ideal home away from home for the modern business traveller. The warm and welcoming Arabic charm encapsulated in each room makes it instantly inviting and everything a guest could possible need is at your fingertips. The hotel is strictly a non-smoking hotel. The hotel offers guests several dining options, including authentic Levantine-inspired cuisine at Boulevard Kitchen, al fresco dining in The Courtyard and meals from the Tri-Nations countries at Nezesaussi, the ultimate sports hub in Downtown Dubai. The hotel is only 10 kilometres (20 minutes) to Dubai International Airport and public beaches. A Tourism Tax is payable locally for all arrivals as of 31/03/14. 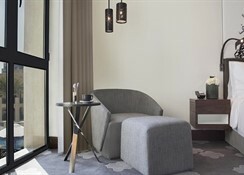 The contemporary rooms feature free Wi-Fi, smart TVs and minibars, plus tea and coffeemaking facilities. Some rooms offer views of the Burj Khalifa skyscraper. Suites add sitting areas. Room service is offered 24/7. Mediterranean, Arabic and French cuisine are served at Manzil Downtown Dubai restaurants. During warm weather guests can dine al fresco in the central Arabian-style courtyard. Amenities include a sports bar/grill and 3 restaurants for Arabic and Levantine cuisine, including 1 with courtyard seating and a shisha lounge. There's also a heated outdoor pool and a 24-hour gym. Meeting and event space is available. 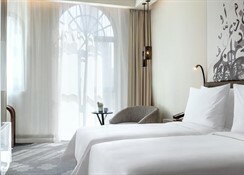 This upscale downtown hotel is 3 km from the Dubai Mall and 6 km from the Dubai World Trade Centre. Jumeirah Beach is 15 km from the hotel. Dubai Airport is a 20-minute drive away. Manzil's Souk is attached to the hotel. Free parking is available on-site.